It is essential to stay prepared with an adequate response to questions raised during a personal interview session. Most of the times, questions asked during this process are common. Since the questions are very general, even the hiring managers expect you to prepare such common job interview questions and answers without any hesitation. No, not at all! You don’t have to memorize a response, but you have to think in advance about words that you will speak out at the interview spot. You can secure strong responses if you prepare yourself in advance. So here are the topmost questions that you are most likely to be asked during the interview process, along with a suitable answer. Besides this, you can also look up to other questions you may be asked, to prepare extremely well and stay confident during the interview process. The following mentioned are few top 15 questions asked in an interview along with their answers. The main motto to ask such question is to check what all attributes of yours fit well for the vacant job post. So while answering such question, make sure that you list down qualities that can get you stand as a most suitable candidate for the job post. Question about weakness is one of the highly typical question that most interviewers ask. Act intelligent by framing an answer that revolves around your positive attributes and abilities as a candidate. 3. Why are you leaving your previous job? Be direct while you respond to this question and remember that your response to it will determine your future. So, make sure that you showcase an answer that does not portray your past company or even you as an accused. You can state that you are leaving the job because there are limited resources, and you desire to explore more of your competencies. 4. Tell us something about yourself? This is the time when you utilize your elevator pitch. If in case you don’t have one then you need to respond the question in a precise and succinct manner. Give a brief introduction of your personality, education, skills, and strengths. 5. Why do wish to work with our company? This question gives you the opportunity to show the interviewer that you are aware of the job and about the enterprise. You have to stay concrete while you discuss your strengths and abilities that make you best fit for the job. Also, mention few aspects of the organization that appeals to you. 6. Are you comfortable working under pressure and stress? The interviewer wants to know about your action plan that you follow when things don’t go smoothly. This finest way to answer such a question is to state an example when you have worked well for a stressful situation. You can give an example from your previous job. 7. Describe a difficult situation at work and how you overcome it? The employer wants to know that have you ever met a terrible situation at work. If yes, then what was your contribution to it, and what strategies or techniques did you employ to overcome it. This sort of question gives your employer with a formal sense of goals, work ethics, and your overall personality. Analyze the company as well as the role and outline an answer based on such evidence. You can even include key concepts from your personal goals and what actions do you follow to achieve them. This is a straightforward question that intends to know that whether you will work long lastingly with the company or you plan to secure short term experience within the firm. Make sure that you answer shows your interest in the job and state if everything goes fine then you are planning to work for an extended period within the entity. 10. Are you comfortable working with a team? Maybe you are hired to work all alone, but there may be times when you need to work with a team to bring success to the firm. So, to judge your working nature in different circumstances, the employer may ask you this sort of question. 11. Will you be able to travel or relocate if required? This is something that you have to be completely clear of while you go to a meeting. There is no point of saying yes if you cannot shift from your place. Stay honest while answering this question as it can help you from getting engaged with other future problems. 12. What are your expectations from this job? Remember that the employer is not asking about the salary. So, ensure that you respond to the question in a way that you can impress the employer with ease. State clearly about your expectations from the job, that where do you wish to reach through it, how will it help to achieve your career goals, and why it will be a perfect choice for your career path. 13. Why are you the best fit for this job? This is a crucial question that needs to be answered carefully. It is even your chance to showcase yourself better than the others. Saying ‘I am truly good,’ will not make it happen. You have to transfer the employer’s focus towards you and explain him concisely that why and how you will be most suitable for this position. 14. Tell us about your recent accomplishments from your previous job? Take it as an opportunity to discuss what all you are capable of and to list all the jobs that you can do. Think about the required skills in the job description and mention accomplishments that are related to those skills. The main agenda of answering such question is to not only convey hiring managers of your past accomplishments but also how your services can help the company to gain more. 15. Do you wish to ask any questions? This is the time when you can generate a lasting impression on the employer. Never end this question by saying a big ‘NO’. Try to use this question. If you have any doubt regarding the job, work environment, company, salary, and more such issues, then you can clear them all by asking questions to the employer. You can even ask for the next time you will hear from them. It will let you understand that whether you are selected for the job or not. Moreover, if you have doubts regarding working hours, leaves and more such elements of the company, then this is the time when you can clear them all. So, make maximum potential use of this question by asking questions that can provide you with a much clear picture of the job profile. 1. How do you handle success? 2. What do you do if you met with a failure? 3. Can you multitask in needs of urgency? 5. What is that makes you a better fit to the position than other employees? 7. Are you interviewing with other firms? 8. Where do you see yourself after five years? 9. Can you give us reasons for changing your career paths? 10. Are you comfortable working on weekends if there is a requirement? 11. What was the most difficult decision you have ever made within your professional field? 12. Are you looking for a long-term or a short-term relationship with us? 13. How would you differentiate between hard work and smart work? 14. What are your short-term and long-term career goals? 15. Have you ever lead a team? With such an extensive list of practice, you will not only able to impress the interviewer, but will also be able to ace the interview. 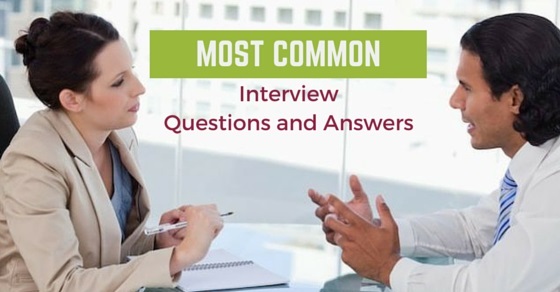 Here we have also provided common top 15 interview questions along with answers. So stay confident, practice well, and all the best for your upcoming interview session! Next articleHow to Pass a Competency Based Interview?